William Hill Casino is one of the most recognisable names in betting and gaming having been founded in 1934 and made the move online in 1998. Though the company is perhaps best known for its Sportsbook, it has a host of popular gaming products, including Vegas, Live Casino, Games, Poker and Bingo. Casino is the most established of all having emerged in 2000, continually improving to maintain its industry-leading standard. 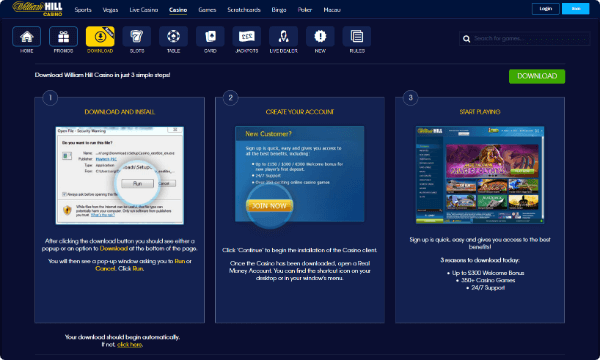 Navigating William Hill Casino is a swift and smooth experience, which shouldn’t come as any surprise given that the software is provided by gaming juggernaut Playtech. This means you never have to worry about games lagging or any threat to your online security. There are no shortage of payout options at your disposal either, among them Paypal, Skrill and Visa. William Hill is licensed and regulated by the Government of Gibraltar. 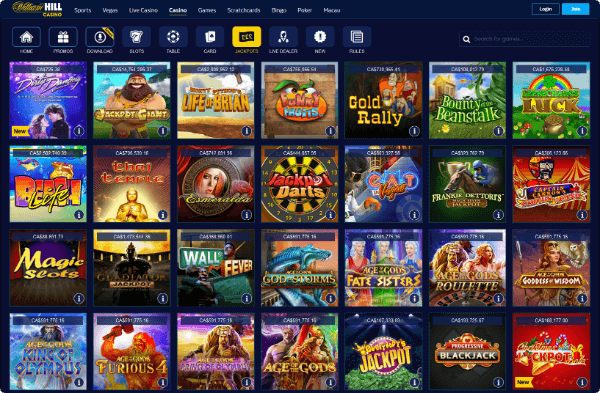 All the major games suppliers are featured at William Hill Casino, with Playtech, NextGen Gaming, Evolution Gaming, Blueprint Gaming and Ash Gaming just a few of the examples. You’ll never run out of games to play as there are constantly intriguing new additions to complement the classics, and the variety on the site is as great as the volume. There are hundreds of slots, such as Epic Ape, Age of Egypt, Buffalo Blitz and Age of the Gods, all of which are engaging for both their gameplay and their visual appeal. If you like roulette, you’ll be astonished by the dozens of varieties on offer, from Dragon Jackpot Roulette and Penny Roulette to variants like 101 Roulette. It’s the same story for blackjack (ever tried Blackjack Surrender or Buster Blackjack? ), while there are plenty of styles of poker to sample. Each of those table games plus baccarat are available in live dealer format too if you want that rush of seeing what you’re up against. Then come the progressive jackpots. 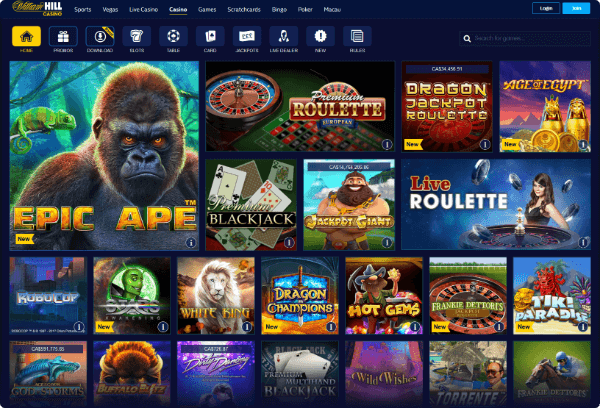 Just hit the “Jackpots” tab on the William Hill Casino homepage for an idea of how many are running at once and some of the sums that are up for grabs – you won’t be disappointed. There were 78 on the go the last time we counted. Whether you play on your mobile or tablet using the app or are on the desktop site, it’s always easy to find your favourite games by hitting the “Recently Played” button. 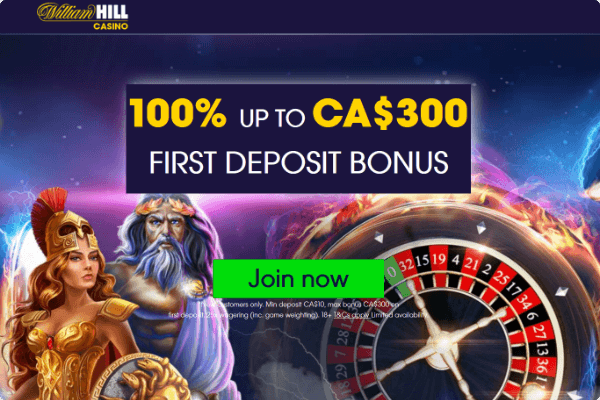 You can get a Welcome Bonus of up to C$ 300 when you first join William Hill Casino, and the offer mechanic is very straightforward. When you make your first deposit, whatever you put in up to that amount will be matched with a bonus of the same size. Once you’re on board, you’ll be able to earn and redeem comp points. If you join the exclusive loyalty program, you’ll receive a comp point for every C$ 10 that you wager – and there’s no limit on how many you can accumulate.